Located in the elegant area Jardins. Close to main highway access, 40 min. from Guarulhos International Airport, 5 minutes Ibirapuera Park, 2 blocks from 9 de Julho Avenue, withhin walking distance of the Oscar Freire Street, a fashionable shopping center where you can find the most famous boutiques as Dior, Baccarat, Versace, Hermes, etc. Golden Tulip Park Plaza is situated in a quiet and fashionable district, within walking distance from Oscar Freire Street, a fashionable shooping centre. 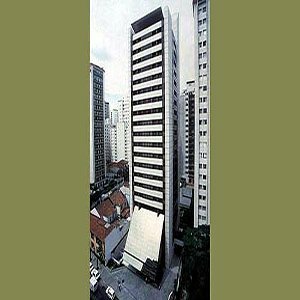 Surrounded by modern boutiques, the hotel is just a ten minutes walk from the main financial and business centre of Sao Paulo - the thriving Paulista Avenue - and 5 min. from Ibirapuera Park. The hotel also offers a fitness center with plenty of health facilities. The Contemporaneo Restaurant serves international cuisine. Golden Tulip Park Plaza is the perfect destination for all of those looking for a little bit extra from their business day. The hotel is equipped with a business centre with all kinds of facilities, well-decorated suites with internet connection, a modern health and fitness centre well equipped for gymnastics and body building, with dry and steam sauna baths, a heated indoor whirlpool and one large outdoor pool. The hotel also offers a complete infrastructure to attend seminars and conferences, with a capacity up to 200 people. Located in the elegant area Jardins. Close to main highway access, 40 min. from Guarulhos International Airport, 5 minutes Ibirapuera Park, 2 blocks from 9 de Julho Avenue, withhin walking distance of the Oscar Freire Street, a fashionable shopping center where you can find the most famous boutiques as Dior, Baccarat, Versace, Hermes, etc.